International financial and investment analysts have been keeping a close watch on China’s debt crisis. The most pessimistic view, based on large amounts of technical analysis, is that it is a result of too much debt risk, similar to the 2008 crisis in the United States when Lehman Brothers collapsed and the credit market became paralyzed. The majority of analysts predict that, once the bubble bursts, China’s economy will sink into a decline similar to Japan’s situation in the 1990s. Actually, from a technical perspective, China should have already experienced several rounds of financial debacles. However, due to fundamental differences between China and Japan, the playing out of China’s anticipated financial crisis will look quite different. On the surface, China’s banking sector looks very similar to Japan’s in the early 1990s, before the bubble economy developed. Both experienced the overly rapid expansion of asset size and credit risk factors. The asset size of Japanese banks increased rapidly, driven by the easing of monetary policy, high savings rates, and ample liquidity. The growth rate of loans far exceeded GDP growth. From 1984 to 1990, Japan’s total banking assets increased by 103 percent, from 373 trillion yen to 757 trillion yen. This rapid asset increase was related to an increase in deposits. Total bank deposits rose from 268 trillion yen to 495 trillion yen, a seven-year increase of 84.7 percent. China’s banking assets have grown even faster than Japan’s. The difference is that they are not composed mainly of savings deposits. Professionals in China’s banking sector do not deny this fact. They have openly admitted that the continuous asset expansion was related to a loose monetary environment. The central government’s boosting of the economy, accelerated credit approval, real estate market, and infrastructure investment appreciation, are all examples of major interest earning assets that have contributed to the overall expansion of asset growth in China’s banking system. A careful study shows that asset allocations of Chinese and Japanese banks are only partly similar. The main assets of Japanese banks consisted of real estate. From 1984 to 1990, Japan’s real estate loans increased from 7.5 percent to 12 percent of total loans and far outnumbered loans made to the manufacturing sector and GDP growth. At the same time, manufacturing loans dropped from 26.6 percent to 15 percent of total loans. Real estate loans in Japan increased the most in 1986 and 1989, with growth rates reaching 35 percent and 27.7 percent, respectively. We need to remember that there is a fundamental difference between China and Japan: In China, financial stability is tied to the stability of the Chinese Communist Party. The Chinese economy is also driven by real estate. But asset allocation is impacted by China’s unique economic system and government intervention. Bad debt comes from several main sources: real estate, large state-owned enterprises, and local governments. China’s banking sector is owned by the government, and state-owned enterprises are known as “the eldest son of the Republic”—they will naturally be bailed out. With these inseparable ties of interests, the fate of China’s banking industry is destined to be different from that of Japanese banks. We could say that China’s banking sector is in worse shape than Japan’s banking industry before its economic bubble burst. However, before jumping to the conclusion that China will have a financial crisis similar to Japan’s, we need to remember that there is a fundamental difference between China and Japan: In China, financial stability is tied to the stability of the Chinese Communist Party. In other words, China’s state-owned financial system “lives and dies” with the regime. In Japan, even if the Japanese Cabinet were to collapse, it would have no direct impact on banks. The Chinese government directly eliminates bad debt for banks. The Japanese government could not do that. It wasn’t until Japanese Prime Minister Junichiro Koizumi’s time in office that there were aggressive reforms to the banking industry. 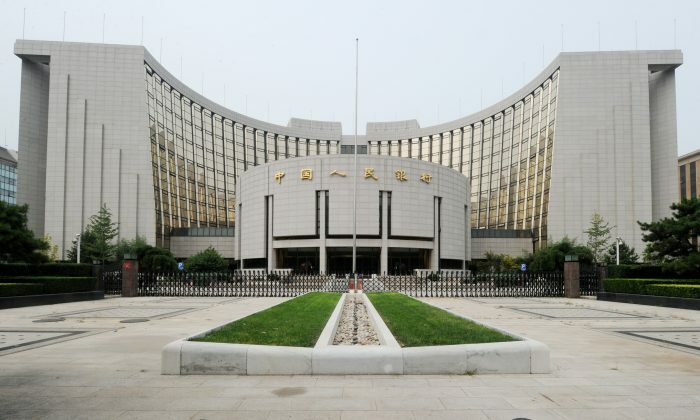 Main reform measures included large-scale mergers and reorganization of financial institutions, direct approaches to resolve non-performing loans (NPL), strengthening the authority of NPL collection corporations, supporting enterprise renewal, etc. These measures effectively reduced the proportion of NPLs in Japan’s banking system. Consequently, from 2002 to 2006, the banking sector’s NPL ratio declined from 8.7 percent to 1.8 percent, and NPL in the financial industry overall fell from 8.6 percent to 3.6 percent. The Chinese government, on the other hand, does not adopt these slow measures used by the Japanese government to resolve bad loans. Its measures are both direct and tough and designed to remove bad debt quickly. For example, when Zhu Rongji was Chinese prime minister, the government directly funded four asset management companies to allow corporations to conduct debt to equity swaps, and help companies and banks eliminate bad loans from their books. When Wen Jiabao was prime minister, the Chinese government allowed foreign banks to become strategic investors to help recapitalize state-owned commercial banks. It also encouraged banks to list in Hong Kong’s and China’s A-share markets. Absorbing funding and listing changed banks from loss to profitability, as well as getting Bank of China, China Construction Bank, and Industrial and Commercial Bank of China among the top ten international financial giants. They became the most profitable banks. Now, the Chinese government is attempting to copy Zhu Rongji’s measures to rid itself of the present financial crisis. But the current situation is different, and those old tricks cannot resolve new problems. China’s financial crisis is the result of the government meddling in the economy and the regime tying its own stability to the county’s financial stability. Accordingly, the last protective measure for China’s financial sector will be the gun. Authoritarian and totalitarian regimes will use any violence necessary to maintain their power. But abuse of power not only distorts the market, it also destroys it. China’s 2015 stock market crash serves as an example. Chinese people are the victims of the debt crisis, paying for it through rampant inflation. This is a translation of He Qinglian’s Chinese article posted on her personal blog on May 1, 2016. He Qinglian is a prominent Chinese author and economist. Currently based in the United States, she authored “China’s Pitfalls,” which concerns corruption in China’s economic reform of the 1990s, and “The Fog of Censorship: Media Control in China,” which addresses the manipulation and restriction of the press. She regularly writes on contemporary Chinese social and economic issues.